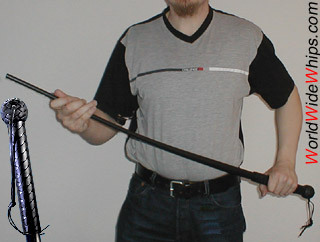 This is the new model of the ColdSteel sjambok. The older model had an ugly, piped and abrasive handle which has now been replaced by a far better one, with a "braided leather look". It provides comfortable grip and better balance. 2 pairs of removeable caps reveal drillings for alternative wrist loop placement. The caps tend to come loose. The thong is 25% thicker and has a better finish. The handle (see detail) has a diameter of about 1.25", a bit too wide.